Like trees, shrubs are appealing not only for their attractive flowers, but also for their permanence in the landscape and the possible offering of food in the fall. Thus, while it is interesting to note those early bloomers, that help to wake up the landscape and our senses, paying attention to leaf shape and architecture can add a subtle dimension to landscape. Walking around the back paths of the LBJ Wildflower center early one spring I smelt the most delightful sweet scent. It was particularly elusive but, following my nose for a bit, I was able to trace it to the Agarita bushes. 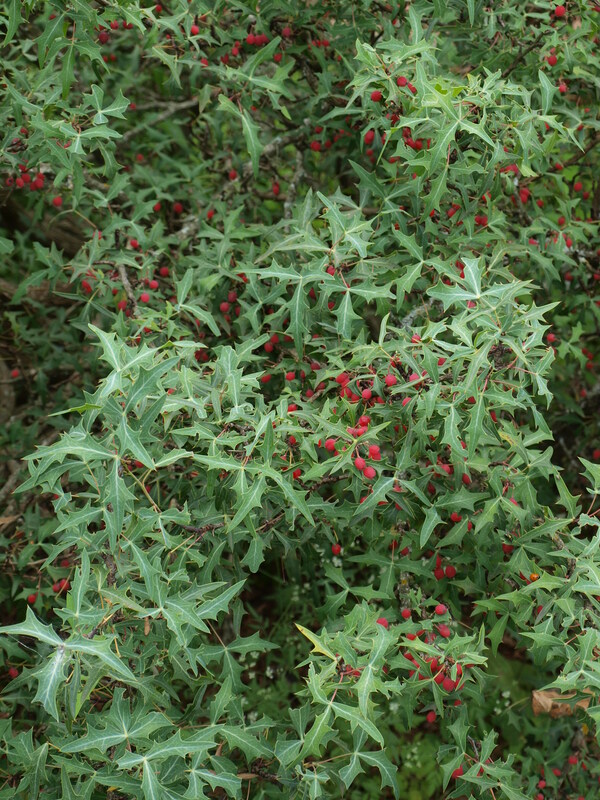 It surprised me that such a delicate smell game from the strings of small yellow blooms as the bush itself is incredibly robust and the leaves are uncomfortably prickly, just like a holly’s. In fact it is known to be selected by birds for nest sites as the dense prickly foliage offers excellent protection. 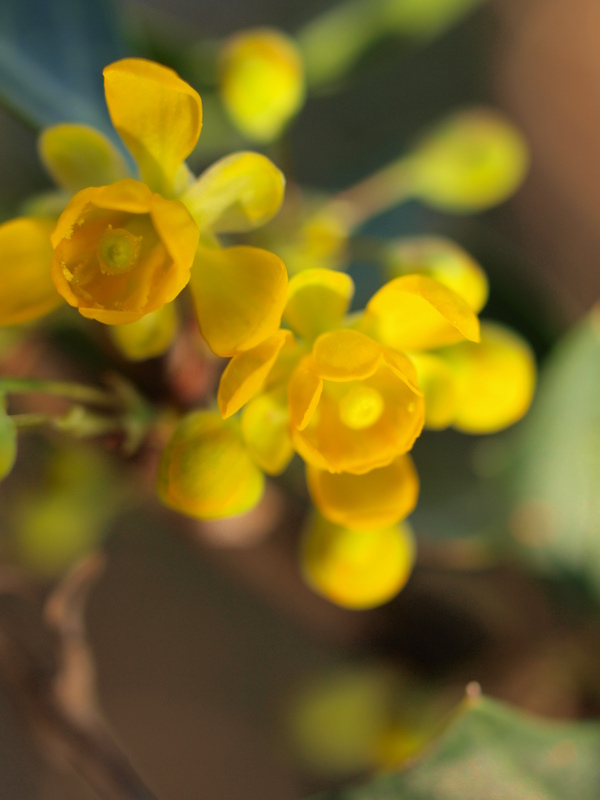 As the picture indicates the ephemeral yellow blossoms result in bright red berries later in the year. Diospyros texana is a wiry looking shrub. It offers a great sculptural element to the landscape heightened by its beautiful bark. 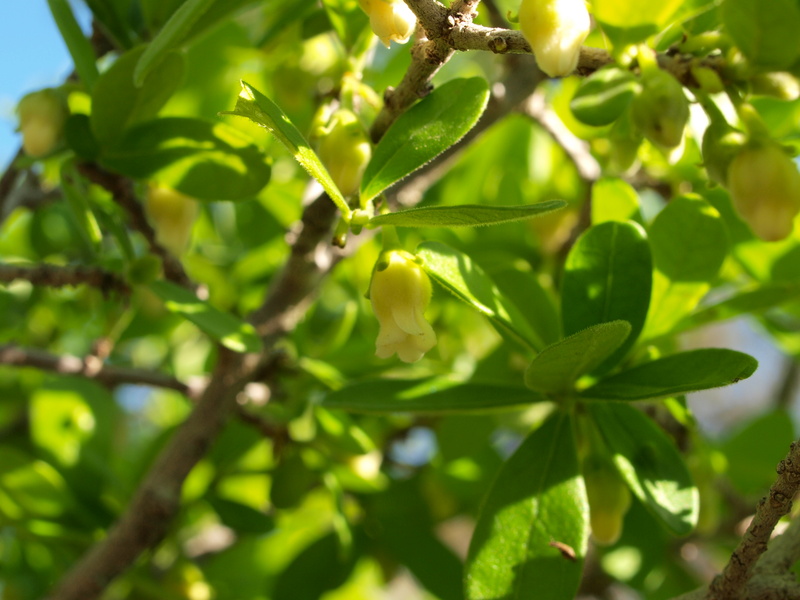 In the spring it has delicate little bell-shaped flowers that produce fruit later in the summer. The small fleshy fruits of this hardy tree provide food for birds and small mammals. In the woodland, surprisingly tropical looking blooms hang overhead. 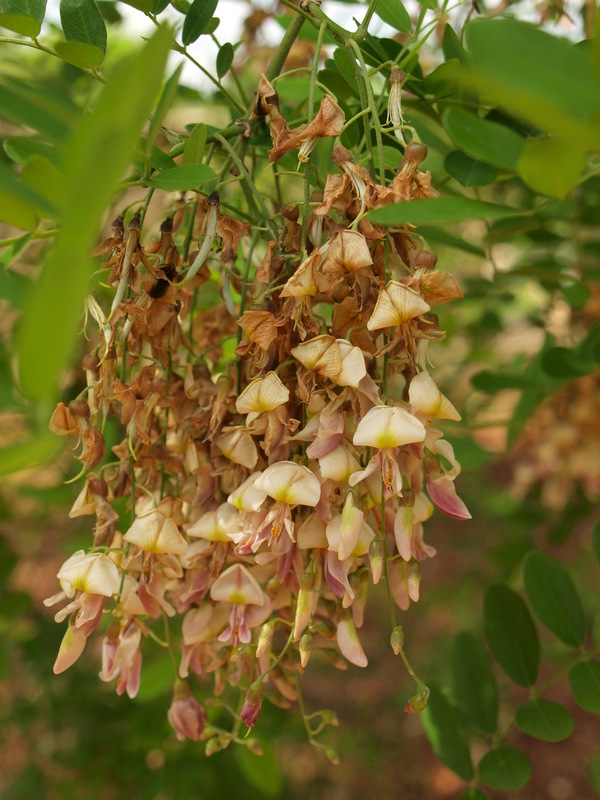 Eve’s necklace (Styphnolobium affine) offers graceful stems, delicate pink yellow blooms clustered on dangling infloresences and vibrant green compound leaves that move easily in the breeze. 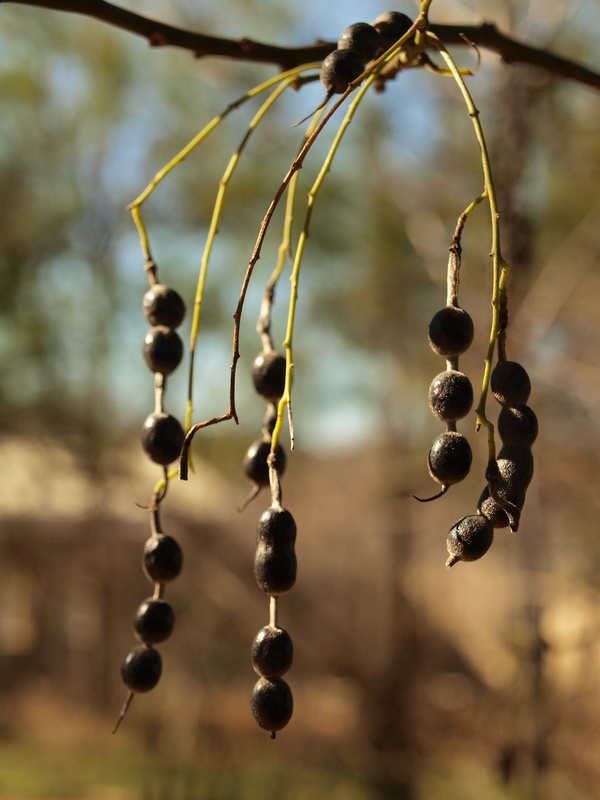 While it is a very attractive, it should be notes that the black seed pods house toxic seeds. Similarly it’s close cousin the evergreen Texas Mountain Laurel (Sophora secundiflora) has very attractive blooms that have a sweet scent, particularly evident in the evening, that give rise to silvery seed pods housing toxic red seeds. This is a very popular landscape tree, although it is slow growing, and this year the flowering in February and March was remarkable! This may be connected in some way with the drought/spring rain weather patterns that we experienced. Part of the delight of a Texas spring is the advent of the rains and the filling of the creeks. 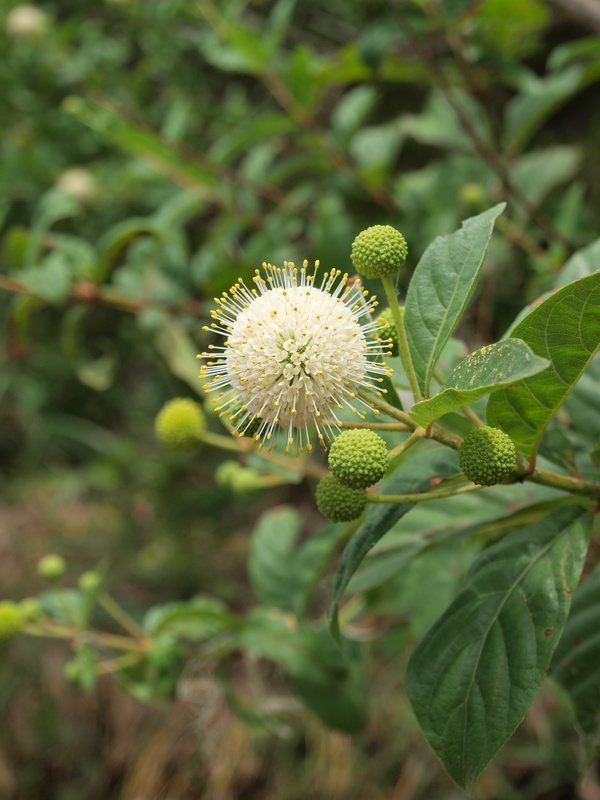 Here along Bear creek, a contributor to the Edwards aquifer, we find Button bush (Cephalanthus occidentalis). 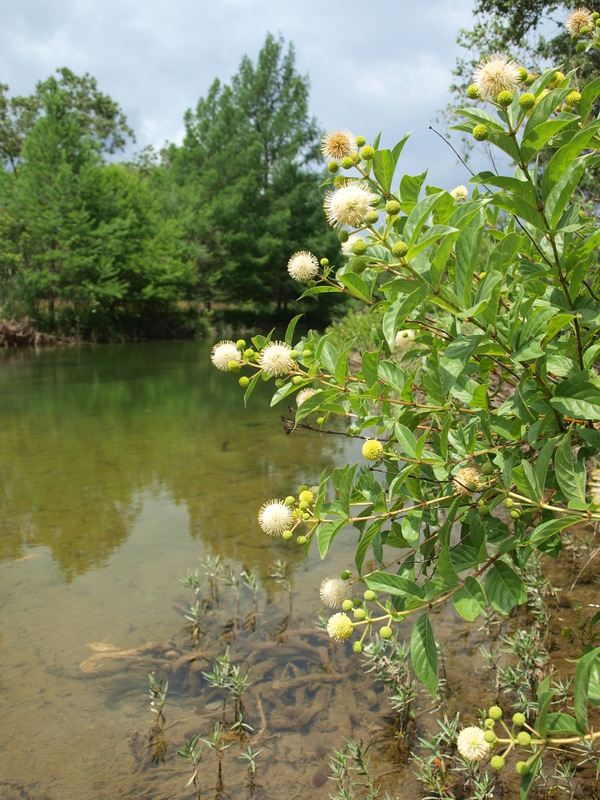 This versatile shrub is particularly useful in riverine areas. It does not mind having it’s roots regularly or partially submerged and it offers both nectar to insects and seeds to ducks and rodents. The glossy green leaves present a third leaf type to consider, the entire leaf. Our introduction to these species presents us with further considerations for the landscape. We had already met the idea of host plants (with Agarita and Texas persimmon), but now we introduce the possibilities of evoking interaction through the senses, smell and sight. Scents can be intriguing and invite exploration while different leaf shapes offer visual interest. Can you suggest particular arrangements or collections of shrubs? How do they meet with your selection criteria? This entry was posted in Host Plants, Shrubs, Spring, Uncategorized and tagged flowers, fruit, nature, plants by botanyfordesign. Bookmark the permalink.